This January 2012 report from Global Financial Integrity, “Mexico: Illicit Financial Flows, Macroeconomic Imbalances, and the Underground Economy,” finds that Mexico lost $872 billion in illicit financial flows from 1970-2010. The report finds that trade mispricing is the dominant source of illicit flows out of Mexico, and may have been accelerated by the North American Free Trade Agreement (NAFTA) with the United States and Canada. 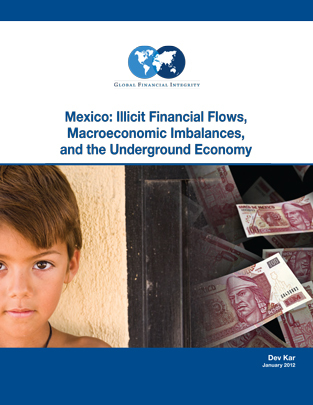 Illicit financial flows are also found to be a major driver of the Mexican underground economy. The report finds that Mexico lost a total of $872 billion in illicit financial flows (or illegal capital flight) over a 41-year period from 1970 to 2010. These illicit financial flows were generally the product of: corruption, bribery and kickbacks, criminal activities, and efforts to shelter wealth from a country’s tax authorities. Total capital flight represents approximately 5.2 percent of Mexico’s GDP over the 41-year period ending in 2010; IIlicit flows peaked in 1995 at 12.7 percent of GDP. Average outflows increased sharply in each successive decade; They were $3 billion in the 1970s, $US10.4 billion in the 1980s, $US17.4 billion in the 1990s, and $49.6 billion in the decade ending 2009. The term, illicit financial flows, pertains to the cross-border movement of money that is illegally earned, transferred, or utilized. Illicit financial flows generally involve the transfer of money earned through illegal activities such as corruption, transactions involving contraband goods, criminal activities, and efforts to shelter wealth from a country’s tax authorities. Dev Kar, the author of the report, utilized the World Bank Residual Model (CED) and a trade mispricing model based on IMF Direction of Trade statistics. The World Bank Residual Model tracks illicit outflows by measuring differences in a country’s recorded source of funds relative to its use of funds. According to this method, illicit outflows exist when a country’s recorded source of funds exceeds its recorded use of funds. The trade mispricing model compares a country’s recorded imports to what the world says it exported to that country; similarly, the country’s recorded exports are compared against world imports from that country. Import values are adjusted for the cost of freight and insurance before they are compared to exports. GFI’s estimates of trade mispricing are based on the gross excluding reversals (GER) method which tracks illicit outflows as a result of export under-invoicing and import over-invoicing.